Have you been to the Las Vegas Convention Center recently? If you have then you have probably noticed some ominous signs around the place warning convention goers that “The Las Vegas Convention Center collects location information from mobile devices. If you prefer not to participate, please turn off your Wi-Fi and Bluetooth function or power off.” Really? You want me to come to your convention center and then turn off my phone? This is 2015….that’s not a realistic proposition. Cox Business, which is the internet provider for the Las Vegas Convention Center, put up the signs in anticipation of anonymously tracking the location data of convention goers via the center’s Wi-Fi. Much to the chagrin of the attendees, this data, according to Cox Business, might be used to create real-time heat maps of attendee movements and a mobile app. The location services of the convention center, which are currently undergoing testing, could launch as early as the end of this year, maybe even before the Consumer Electronics Show in January, which would be huge. Location tracking is becoming more and more popular with companies that provide internet at public places, like malls or airports. These areas are perfect places for managers to discover valuable maps of how people move around. Data gathered about foot traffic could provide useful when deciding where to put things like food courts, convention booths, or even a cafe. The Las Vegas Convention Center is looking to be more competitive in meeting the needs and desires of its clients, according to Communications Director for Cox Business in Las Vegas Juergen Barbusca. Cox took over the contract for the Las Vegas Convention Center back in 2013 and installed a dense Wi-Fi canopy inside the center which includes more than 2,100 Wi-Fi access points located every 60 feet. The Wi-Fi is capable of identifying a mobile device whenever a smartphone sends out a signal to its network. In addition to that, the network receives information about a device’s address, though no personally identifiable information the user is recovered without the user’s consent. “Any device that is sending out messages can be seen,” Communications Director of Technology in Las Vegas for Cox John Fountain added. Looking for a Quote on a Laptop Rental for Your Las Vegas Business Event? 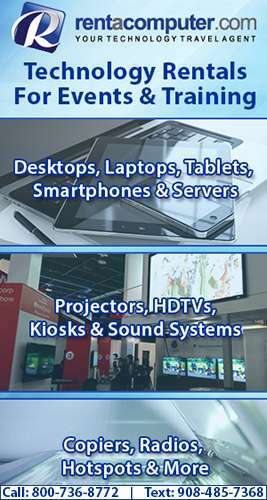 Rentacomputer.com offers Laptop Rentals to any business, hotel, meeting space or convention center in Las Vegas, including the Las Vegas Convention Center! Heywood Sanders, Professor of Public Administration at the University of Texas, San Antonio, says that there is an “astonishing level of competitiveness” for conference space. Sanders is also the author of “Convention Center Follies: Politics, Power, and Public Investment in American Cities”. With the amount of conference space that has materialized over the past several years in the US, some of the biggest venues in the country have struggled to increase their yearly attendance, including centers like McCormick Place in Chicago and the Georgia World Congress Center. Other convention centers have experimented with tracking attendee movement, Sanders adds, including radio-frequency identification technology in badges that track the movement patterns of guests. The ubiquity of smartphones, Sanders says, makes Wi-Fi monitoring easier to track patterns, though he cautions that “the real value of Wi-Fi based monitoring is still open to some question. Cox is looking into another that would direct attendees to the nearest bathroom, connect them with clients or find food locations. Cox sees opportunities for advertising and push notifications as well, provided users agree to the service. And even though many conference centers across the country use Bluetooth to track attendee movements via third-party vendors that install Bluetooth beacons that track mobile devices for the entirety of the convention, conference or event, the Las Vegas Convention Center hopes that its in-house service will be a more cost-effective replacement for RFID badges.